We just uploaded the new major version of our Image Source Control plugin for WordPress. ISC Version 1.2 now comes with an option panel. These are the main new features. Until now, all texts that came with Image Source Control were static. Even though the default texts where general enough for most WordPress blogs, some of them needed customization. From version 1.2 on you can choose the headline that is displayed above the image source list of a post or page. You can also choose the default text that is displayed in the list, if a listed image belongs to the author. 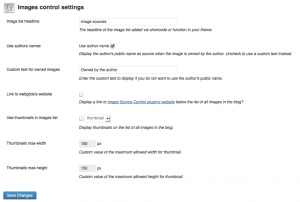 You can find the new admin panel for Image Source Control in your WordPress Backend under Settings > Image Control. Another new feature is possibility to display thumbnails of an image in the list with all images from the post. You can even specify the size of these thumbnails to be either one of the sizes set via the WordPress settings or customize it. If the author should be used as the source of an image, until now you were only able to display a default text. Image Source Control version 1.2 not only allows customization of this default text, but also to display the real name of the author instead. To update Image Source Control just visit your WordPress backend and see the plugin overview for more information. To download ISC simply visit Image Source Control on WordPress.